Cultivate Learning has played a central role in developing the Practice-Based Coaching Framework. Initially developed through the Office of Head Start’s National Center on Quality Teaching and Learning at the University of Washington, PBC is an effective way to support professional learning and improved child outcomes. The PBC cycle is rooted in collaborative partnerships and a deep commitment to equity in early learning. It provides a flexible, relationship-based framework for coaching partners to make decisions about who will coach (expert, peer, self) and how coaching will be delivered (individually or in a group; face-to-face or online). 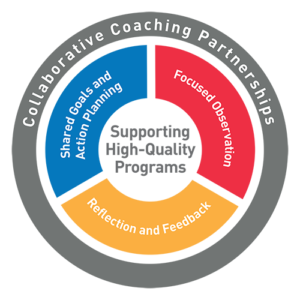 Upon this foundation, coaching partners engage in an evidence-based cycle of shared goals and action planning, focused observation, and reflection and feedback. The Cultivate Learning PBC Framework is rooted in decades of research on adult learning and effective coaching practices. High-quality courses, workshops, and institutes help educators come to Know and See effective practices that support child development and learning, and practice-based coaching helps them continuously Do and Improve those practices in their own classrooms and programs. Across Washington State and the nation, coaches and educators are working together in their own communities to enrich learning experiences for all children. In Washington State, along with the Early Achiever standards, Early Achievers Institutes, and Early Achievers resources, the coaching Framework was one of several developments that emerged from our partnership with the Department of Children, Youth and Families, Child Care Aware, and School’s Out Washington. The Coaching Companion is a powerful, web-based video feedback and annotation application for coaches and educators to collaborate. Educators upload video and documentation of their teaching practices with children in their learning environment and receive detailed feedback from a coach or peer. 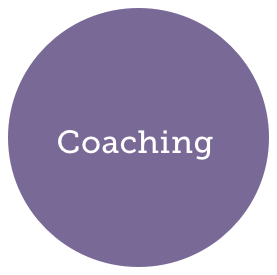 The Coaching Companion helps coaches and educators work together in a collaborative partnership to track progress through goal setting, focused observation, and reflection and feedback cycles. The Coaching Companion contains a robust media library featuring exemplar videos of effective teaching practices and research-based training materials—all within in a password protected, secure platform. The Coaching Companion EarlyEdU version is developed specifically for college students and their instructors, and is used in EarlyEdU college courses to support competency-based assignments in which students demonstrate their use of effective teaching practices. The Certificate in Practice-Based Coaching is a nine-month program designed for coaches working with early childhood and before- and after-school professionals. In this competency-based certificate program, coaches deepen their understanding of practices that promote engaging interactions and positive behavior support through culturally-responsive shared goals, action plans, focused observation, reflection, and feedback. Coaches who are completing a degree can earn college credit, and those who complete the program can move on to advanced coaching work, graduate study, and leadership in the coaching field.